I was recently reacquainted with my original DCI number. Although I began playing Magic in late 1993, I didn’t hit my first DCI-sanctioned tournament until the Spring of 1996, when I walked into the dorm rec room to play in a Magic tournament and was told that it was “sanctioned” and that I’d need to get a “DCI number.” I stopped playing Magic for a long while soon after, and when I returned to the game, I picked up a new DCI number. Just recently, a friend helped me track down my original number, and I’ve now had the two unified. I am once again the proud owner of a five-digit DCI number. One of the fascinating consequences of uniting my old and new DCI numbers is the ability to review my early, early play record. I learned, for example, that my fourth ever opponent in sanctioned play was John Immordino, who just a few months later went on to top eight Pro Tour Columbus. Columbus was the third Pro Tour, and the first done in the Block Constructed format (in that case, Ice Age). I also clearly recall the decision I had to make the night before the tournament. I’d been thinking of bringing a black/white deck splashing blue for Diabolic Vision, but I didn’t like how the mana was working out. As a consequence, I made the game-day decision to cut the blue, and ended up playing a straight black/white deck featuring Swords to Plowshares and Wrath of God, as well as a creature suite of Nether Shadow, Ashen Ghoul, and at the top of my curve, Serra Angel. Creatures are so much better now. My decision to cut the blue segues well into my topic today – building a modern Junk deck. What is a “Junk” deck? 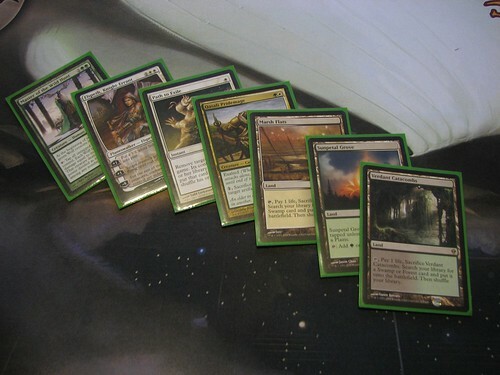 Although the original Junk deck was a G/W build, these days the term has become shorthand for W/B/G decks generally. We similarly use the shard names, such as “Naya,” as shorthand for those three-color combinations, and the Ravnica guild names as shorthand for color pairings. This is not an especially useful naming method. All of this goes to the point that your idea of what Junk, or Jund, or Naya should be may not align with someone else’s concept of what the archetype is. In the broadest sense, Junk is simply anything featuring the W/B/G color combination, including Lorwyn-era Doran decks and Daniel Grafensteiner’s deck from PT San Diego. With that in mind, let’s compare that approach with my design choices in building Stoneforge Mystic Junk. The fundamental “tuner” for contemporary Junk decks involves balancing power and resilience. I favor resilience, but power is a perfectly reasonable choice. I’ll address these, and the card selections they favor, in turn. In picking a high concept description of a power-oriented Junk deck, I would turn to Jamie Wakefield’s idea that “The last fatty kills you.” The idea here is that, as much as possible, each of your creatures is a catastrophe for your opponent, assuming they don’t kill it. In the modern era, we can extend this concept to include planeswalkers. This is a deck that, after sideboarding, can have fourteen removal spells as well as six “removal creatures” in the form of three copies each of Siege-Gang Commander and Master of the Wild Hunt. When your opponent has more removal than you have major threats, then the “must kill” strategy can fizzle out pretty disappointingly. However, there are those games where your deck just serves up a third-turn Baneslayer and your opponent doesn’t draw removal in time. In a sense, this is a Standard take on the goldfishing strategy, hoping to reap the rewards of free wins from games where you play a threat that your opponent simply can’t interact with. As I mentioned above, my preference is for resilience over power. This fits into my play preferences in general, as I love highly interactive games with a great deal of on-board action. If you read last week’s In Development, you know that I had two different matches in which I won 40+ minute-long game ones, taking both matches in just the one game. Although Stoneforge Mystic Junk plays many of the same power cards as more typical, power-oriented Junk builds, it approaches matches from a fundamentally different philosophical base. Whereas power-oriented Junk wants a stream of significant threats, resilience-oriented Junk wants the tools to turn all of its cards into threats. This is why I went to three copies of Stoneforge Mystic for my deck, because I wanted to make sure I could land a Basilisk Collar or Behemoth Sledge as soon as possible. With either equipment on the board, any one of my random dorks is a legitimate threat and an opportunity for recovery. Hopefully the inclusion of the Stoneforge Mystic package is obvious. Emeria Angel and Elspeth, Knight-Errant make the “must have” list because they both generate opportunities for stabilization as well as platforms for Collars and Sledges. Stirring Wildwood is a key card because it dodges a significant portion of opposing removal, and can nonetheless pick up a Collar or Sledge as needed to move you into a winning position. Finally, Thornling wins over Baneslayer Angel by dint of being nigh-unkillable. When we care about resilience, that’s more important than pure offensive power. I’ll wrap these concepts of power and resilience in some deck lists at the end of today’s piece. Before I get there, however, I want to check in on a key element of any Junk deck. So why do Junk decks have black cards? The original Junk deck was a G/W build. We can have many of the features of a modern Junk deck in pure G/W form. After all, the deck’s acceleration and most of its resilience or power come in the form of green and white cards. Even if we want to maximize our use of fetchlands to power out large Knights and a flock of Angel-generated Birds, we could simply have four copies each of Verdant Catacombs and Marsh Flats without bothering to have a single Swamp. There’s always the temptation to say, “Well, since I already have these fetchlands, I might as well have a Swamp and some black cards.” Hopefully none of you are autopiloting to that extent. I think that it’s entirely reasonable to just eschew black, especially in the case of a power-oriented Junk build. In my case, however, I want access to one of the best generic removal spells around in the form of Maelstrom Pulse, as well as the ability to play Grim Discovery out of the sideboard. Other reasonable options in black include Deathmark and Doom Blade. I would discourage you, however, from trying to shoehorn in Putrid Leech, Ob Nixilis, Malakir Bloodwitch, or any number of other cards that require a more intense commitment to black. These are tempting cards to add, especially if you’re already committed to splashing black for Maelstrom Pulse, but they fundamentally screw up an otherwise clean mana base. So how do you use your fetchlands? 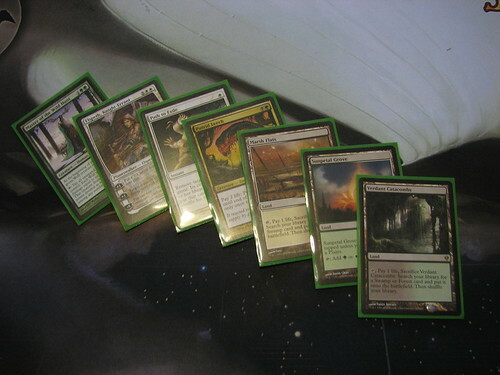 In the case of the deck that isn’t running Putrid Leech, and in most Junk decks whose black cards are limited to Maelstrom Pulse and a few other splashables, you can use your early fetchlands to grab green and white sources. In contrast, to get any real value out of Putrid Leech, you’re going to want to cash in one of your fetchlands for a Swamp to power out a second-turn Leech. 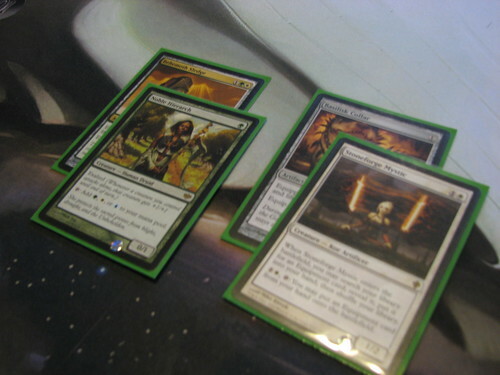 This choice dramatically influences the subsequent flow of your deck. If you’ve cashed in the Catacombs to get a Swamp, then a Plains off the top of your library will let you cast Elspeth, but not the Master. Similarly, if you used the Flats to get your Swamp, then a Forest off the top can’t help you cast Elspeth. The situation is significantly worse if you’re trying to shoehorn in cards that require double black, as this means that the first task for your fetchlands necessarily must be acquiring Swamps to ensure that you’re actually able to cast these spells. If you reflect on how disruptive it was to have to dedicate one of your fetches to grabbing a Swamp, consider how many of your major threat cards you’ll be slowing down by trying to get a second Swamp. You might point out that Lotus Cobra can help you power out these cards, but that dramatically increases the fragility of the deck without yielding a concomitant increase in power. Ob Nixilis is not nearly so impressive when he’s trapped in your hand because a Bolt burned your Cobra. With all these points in mind, I’m going to run out a couple deck lists. Baneslayer Junk can generate amazingly explosive starts. 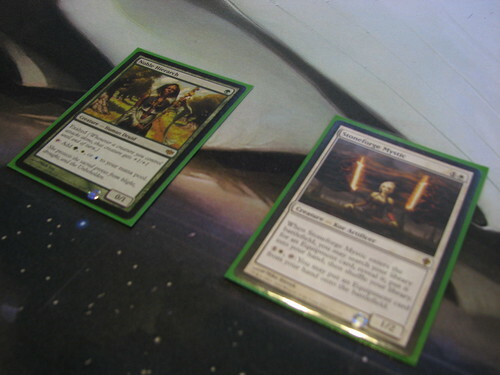 For example, one playtest game saw a turn four board that included Elspeth, Lotus Cobra, a Soldier token, Noble Hierarch, and a Master of the Wild Hunt, with the Lotus Cobra swinging for six damage in the air that turn. Against, say, a Jund deck that had its first two lands come into play tapped, this may simply be an unrecoverable situation. Unfortunately, the sideboarded games against Jund are sort of a circus of Deathmarks, which can easily take the wind completely out of your sails. Once more, it’s high power and low resilience. The Marshal’s Anthem is the only real “reload” card in the main deck. I think it’s useful in this take on Junk both by dint of powering up your Cobras and Hierarchs and because it lets you bring back your Baneslayer when they kill it. Note that this is a bit of a concession to resilience. The original “all in” plan actually had a pair of Admonition Angels in that space. This update of last week’s Stoneforge Mystic Junk deck makes some changes based on a week of intermittent play. Most notably, the Wolfbriars are out, as they were never the kind of “reload” I wanted them to be. I also tinkered with the Qasali Pridemage count, but decided to return to a full set of four as I still want access to removal for opposing equipment as well as Oblivion Rings and other concerns. In addition, Pridemage is a solid, aggressive creature that wields Behemoth Sledges and Basilisk Collars quite effectively. Notably, I’ve pulled the Borderland Rangers from the deck entirely. It’s still sufficiently resilient against Jund even without them, and the space opened up by removing the Rangers and Wolfbriar Elementals has let me put in three copies of Master of the Wild Hunt as well as a single Marshal’s Anthem. The Anthem is particularly effective in this Junk variation, as it turns your 0/1s and 1/2s into 1/2s and 2/3s, which is a surprisingly effective jump. Also, pay attention to the fact that you can equip Basilisk Collar to one of the Master’s wolves, giving you the Junk variation on the [card]Cunning Sparkmage[/card]-Collar combination. This is a middle ground deck, and it reflects my current belief that if you are going to include Baneslayer Angels in a Junk deck, you should probably go ahead and include Lotus Cobras as well. Rather than being some kind of wry social commentary on the expense of Mythics, I think this follows from the fact that a Lotus Cobra can serve up a third-turn Baneslayer. If you’re going to run Baneslayers, you want to maximize your likelihood of just “randomly winning” by powering one out before your opponent can respond. This does mean giving up the added resilience intrinsic in having Qasali Pridemages, but I think it’s worth it overall. This deck maintains a slightly reduced Stoneforge Mystic package as a way of trying to build in added durability. When they kill your Baneslayer, you can still Behemoth Sledge up a Lotus Cobra and try to bring the game home. 1. You must play briskly. Games can go long, especially with lifegain on both sides, as is the norm when playing against Junk or Naya. If you play slowly, you will not finish your matches in time (or, on MTGO, risk running out your match clock). 2. You must be able to evaluate in the early stages whether a game should be winnable. This takes some practice and playtesting. Basically, if you’re going to have a long game, you need to know you’re going to win it. My experience is that more games are winnable than people realize”¦but keep in mind that I have a tendency to win a lot of one-game matches because I’m able to make this evaluation and willing to stick with it. The corollary to this is that you need to enjoy highly interactive games that might go long. If not, then I’d tend to direct you back in the direction of Lotus Cobras and Baneslayers. 3. You must be able to flexibly plan a few turns ahead so you can make the correct decision to, for example, chump block with one of your creatures while you set up an Emeria Angel and a fetchland to allow additional chump blocking with your Birds until you draw removal for their Baneslayer and go on the offensive. In this example, your opponent may have just gained 15 life while you set up your counterattack. That will happen, and it’s fine. Fundamentally, there is no “right way” to build a Junk deck. However, there will definitely be a “right way” for your play preferences. If the Baneslayers just aren’t doing it for you, it may be time to bring in the [card]Stoneforge Mystic[/card]s and experiment with a new way to play.